The aim of this site is to document the organisational history of the land forces of the Austro-Hungarian monarchy from just prior to the outbreak of the Great War until the collapse of the monarchy in 1918. The subject is complex and large. Very little is available in the English language and what is available tends to be of the allied forces intelligence type information and books derived from those sources. These were of necessity produced during wartime in difficult conditions and are not to be considered as fully reliable or accurate. In compiling the tables of units on this site we have therefore consulted the original “Schematismus” (army lists) and the official Austrian history of the Great War – “Österreich-Ungarns letzter Krieg”. These are not only primary sources but also have the advantage of also providing accurate German language terminology and spelling. As previously stated, the subject is huge and therefore the site will be a continually evolving project. We intend to produce as time goes on not only the organisation of the land forces, but also biographies of senior commanders, individual regimental histories and details of particular engagements and battles in the not too well documented Italian, Galician, Carpathian, Rumanian and Serbian theatres of operations. The primary motive for producing a site of this type was to document the largely unknown subject of the Austro-Hungarian forces and to provide a mirror to Mick O’Shea’s Pocket German Army site. In this way we can hopefully provide information on both of the major players which made up the central powers in the Great War. We have additionally decided to also expand the scope of the site to encompass the period from 1848 up to the collapse of the Monarchy and the post-war Bundesheer. We welcome comments and suggestions and can be reached via email. Finally a word of thanks to Klemen Lužar for his fine contributions on the Isonzo front, to Christian Frech for his expertise on organisational and MMThO themes, to Enzo Calabresi for providing photographs from his superb collection and to Christian Ortner for his excellent knowledge on the Austro-Hungarian Assault Troops and their insignia. Of the year 1848 the British historian Trevelyan remarked that it was the great turning point at which history failed to turn. Given the accumulation of tensions and conflicts since the Congress of Vienna, nationalistic passions, the miserable condition of the peasantry, entrepreneurs chafing under restrictions placed on them, intellectuals stifled by censorship and other restrictions on freedom of expression, it was nearly a miracle that a dynasty that was known for its mediocrity more than for anything else was able to survive the upheavals of 1848–49 and reestablish itself with its powers undiminished. The lack of creative leadership among revolutionary forces, except in Hungary, was no doubt a factor in the failure but there was also the almost mystical staying power of the Habsburgs in face of all adversity, it gave them reason to trust divine providence to which, more than to their subjects, they felt responsible. The first reaction to the news from Paris erupted in Hungary, where Lajos Kossuth early in March demanded a democratic constitution providing for popular representation. Vienna liberals quickly took their cue; ad hoc assemblies composed mainly of staid bourgeois began drafting petitions to the throne almost identical to the one issued by Kossuth. On March 13, demonstrations, heretofore peaceful, erupted into armed clashes in the Austrian capital when a crowd of students surrounded the parliament building in the Herrengasse and police fired on them; a number of demonstrators died. Soon violence spread to other parts of the city. The two ranking archdukes on the state conference decided to offer up to the crowd the aged Metternich, the most resented figure in the empire. That evening Metternich, after a feeble attempt to display his steadfastness, resigned and took the long road into exile. As had happened in France, the disorders were largely confined to the capital; apart from some minor outbreaks in Graz, the countryside remained quiet. But outside the German lands, in Hungary, Italy, Bohemia, Galicia, even in Croatia, the ferment was unmistakable. The Vienna court hesitated between making concessions and applying force. The latter was the customary course of action but tempers were too explosive to employ it without grave risk. Mere personnel changes in the government after the flight of Metternich were not likely to satisfy the demonstrators. The mention of a constitution, on the other hand, even if insincerely meant, still carried magic. Accordingly, on April 25 the new interior minister, Baron Pillersdorf, proclaimed one, though only for the hereditary lands. It provided for a bicameral legislature, the lower house elected by adult male taxpayers, the upper named by the emperor from among landed magnates and trusted aristocrats. The emperor, according to this forlorn document, had an absolute veto over measures passed by either house. The draft did not calm revolutionary passions; crowds invaded the royal palace, demanding the withdrawal of Pillersdorf’s proposed constitution. Ferdinand and his court, insofar as they had any policy at all, geared their reaction to the disorders to the degree of danger they represented. By May passions seemed to have cooled and the emperor attempted to dissolve the national guard, which had made itself responsible for maintaining order in the capital. This occasioned another uprising and, reluctantly, the royal court decided that Vienna was no longer a safe city in which to reside. Ferdinand fled to the town of Innsbruck in the loyal Tyrol, where he was received with thunderous enthusiasm. However, Vienna was still the functional nerve center of a sprawling empire, and the streets there were ruled by a bourgeois national guard, well-to-do men of progressive views, whose aspirations did not go further than royal assurances for the protection of, first and foremost, private property. They were joined by “academic legions,” composed largely of university youth. In June the government at last convoked the parliament provided for in Pillersdorf’s draft, the Reichstag as it was called, but that body, made up of a majority of Slavs, rejected the very constitution on which its authority rested. Discussions of proposed reforms continued but the only one of import that emerged, on September 5, was one calling for the emancipation of the serfs. In August the emperor and his entourage, satisfied that responsible elements were once again in charge in Vienna, returned to the capital from Innsbruck. 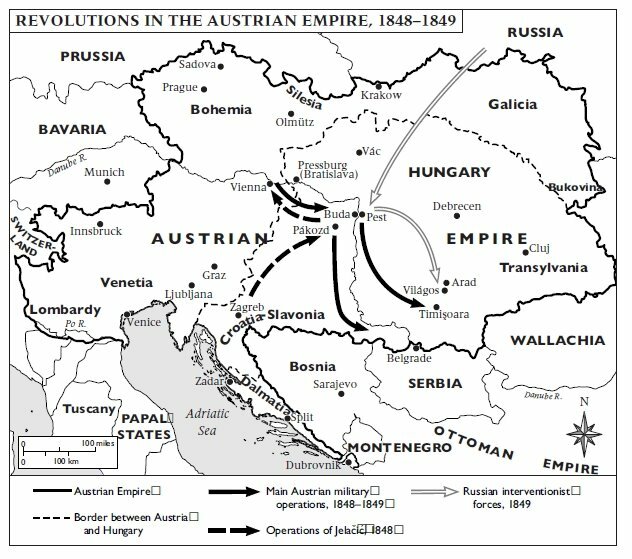 By now, however, events in Hungary rather than developments in Austria determined the course of events. Kossuth asked the help of first the court and then the newly elected Reichstag in curbing Croatian ambitions, but he met with refusal. There was no single political will left in Vienna. The court, stubbornly conservative, granted only such concessions as it could not avoid if it wanted to maintain itself, always in the hope that once order was reestablished it could withdraw them. The popular mood in Vienna, however, was still revolutionary and favored any action that defied the Habsburgs; in the matter of Jelačić’s defiance, it sided with the brave Hungarians. When an Austrian artillery company under orders to march against Hungary crossed the city, crowds prevented its passage and bloody street battles erupted. Vienna once again became unsafe for the royal house, and Ferdinand and his court moved, this time to the Moravian city of Olmütz. A few days later the Reichstag too left Vienna and reconvened in another Moravian town, Kremsier. Obviously though, these were temporary expedients. The displaced court made preparations to reconquer Vienna by military means. On October 31 Marshal Windischgrätz, having reduced to rubble the Bohemian capital of Prague, where a disorderly pan-Slavic conference was meeting, took his artillery to the walls of Vienna and inflicted a similar fate on the capital. Royal authority was finally reestablished, and even though the price was high, the court was willing to pay it. The time for concessions had passed. They had led to nothing but demands for further reforms, and terror became the order of the day. Active and suspected revolutionaries in the Austrian capital, among them lawmakers and respectable citizens, including a number of journalists, were rounded up, summarily tried, and often shot. Military force and military justice accomplished what months of political maneuvering could not; Vienna was secure as the Habsburg capital and reform was off the agenda. Illegitimate son of the elector of the German state of Hesse, Baron von Haynau entered Austrian military service in 1801 and fought in the wars against Napoleon. He remained in service after the war and saw action during the Italian uprising against Austrian rule in 1848. 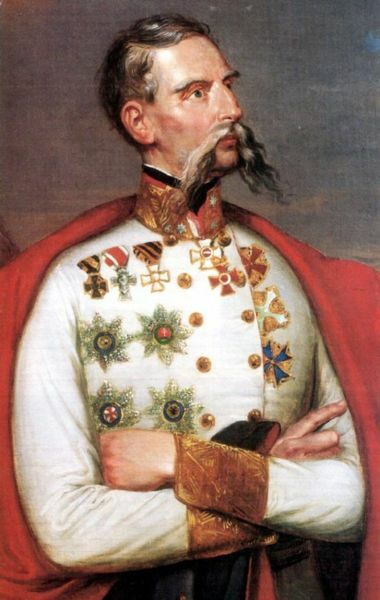 In April 1849, under orders as military governor to suppress the revolt in the Lombard city of Brescia, he acted with such severity that he earned the nickname “Hyena of Brescia.” In short order his services were required on another front: the Hungarian uprising against Austria was still in full force. In April 1849 FRANCIS JOSEPH, emperor for only four months, was compelled to seek military help against the Hungarians from the Russian czar, Nicholas I. Pending the arrival of Russian forces, at the recommendation of Marshal Radetzky, who had conquered the Italian revolt, he appointed Haynau commander in chief of the Austrian forces engaged against the Hungarian rebel army. True, Haynau’s personnel file contained items that might have given the emperor pause, but then, the chief job of the general was to liquidate a stubborn revolt. A previous commander of his had this to say: “Haynau is 61 years old, but he looks in his seventies, is of ill health. He thoroughly knows the rules of military service but seeks glory in sharpening those rules so that he could proceed against men he doesn’t like. These men he torments with calculating hatred. He is well versed in strategic studies but is possessed of an avarice that offends his military honor. Because of his moral failings everybody in contact with him wishes to see him go, for no one likes to be in his company in military service. It would be best to pension him off.” Possibly though these were just the qualities the young emperor deemed useful in dealing with rebels. 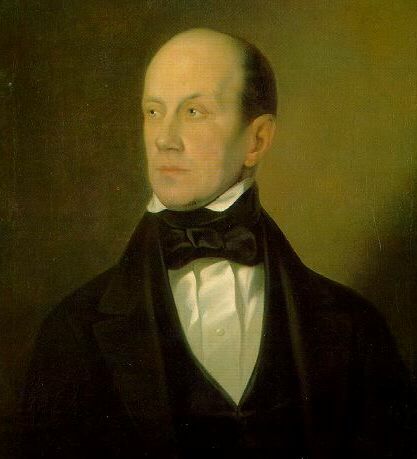 On August 16, 1849, when the Hungarian forces had already surrendered to the Russians, though the news had not yet reached the capital, a council of ministers in Vienna instructed Haynau to deal with the rebels leniently, to allow political and military officers to go abroad within a fixed time period, and enlisted men to return home. But four days later, with Hungarian surrender an accomplished fact, the emperor, under the influence of his mother Sophie and his premier FELIX SCHWARZENBERG, who declared that “We must not shrink from a little blood bath,” decided to deal with the former insurgents harshly and gave Haynau full powers to carry out the retributions. Haynau prepared to have some hangings as early as August 24, days after the Hungarian army had laid down its arms, but the Russians intervened. They did not want to be witness to the retributions they themselves had helped to bring about. Also, there still were pockets of Hungarian resistance, and they might become more determined if the rebels knew what fate awaited them. But once all military action ceased and the Russians had retreated, nothing stood in the way of reprisals. The first victims were 13 military officers hanged in ARAD, and the former Hungarian minister president BATTHYÁNY, executed in Budapest. Under Haynau’s dispositions, the summary trials and condemnations continued. Just how many fell victim to them has never been established. According to Austrian statistics, during the fall and winter of 1849, 120 persons were executed following court procedures. Many more were shot “trying to escape.” About 1,200 were sentenced to prison. Thousands emigrated while 40,000 to 50,000 men were conscripted into the imperial army. These actions occasioned vocal protests from abroad. British foreign secretary Palmerston was quoted as saying, “The Austrians are the worst beasts among those who ever called themselves cultured people; their atrocities in Galicia, Italy, Hungary and Transylvania can only be compared to the outrages of African and Haitian negroes.” Under the influence of foreign protests, and because most of the political criminals had already been dealt with, the Austrian Council of Ministers on October 26 banned further executions. But Haynau remained unimpressed and ordered further condemnations and hangings. It placed the emperor in an embarrassing position. If he dismissed Haynau he in effect impeached his own judgment. After a decent interval he bestowed on the general the dignity of baron (Freiherr) and then, largely at the instance of his new minister of the interior ALEXANDER BACH, he dismissed him in July 1850. Haynau then made several trips abroad, but his reception was so hostile, at times, as in London in 1850 and Brussels in 1852, leading to mob violence, that he had to return home. In 1853, with troubles again brewing in Italy, the emperor recalled him to active service; only his death on March 14, 1853, prevented another grimly memorable tenure as military governor. The First Punic War began when both Rome and Carthage answered a call for assistance from different factions within the same Sicilian community. Throughout the resulting twentythree- year conflict the fighting was to focus overwhelmingly on Sicily as each side attacked the other’s allies and strongholds on the island. Although there was much land fighting, this was overwhelmingly a naval war, and all the decisive moves occurred at sea. Rome’s first military expedition outside the Italian peninsula was also to be her first large-scale experience of war at sea. The great naval battles of Greek history had been fought principally by triremes, galleys with three banks of oars with a single rower to each oar. By the third century the trireme (a ‘three’) had been outclassed by the quinquereme (a ‘five’), but the precise nature of this ship remains obscure. Clearly it had something, probably rowers, at a ratio of five to three compared to the trireme, but it is not clear how these were deployed. There were two basic tactical options for all sizes of ancient warships. Either they attempted to grapple with an enemy ship and board it, relying on the crew’s numbers or fighting quality to capture the ship in melee, or they tried to ram the enemy and pierce his hull or shear off his oars. Although galleys were usually fitted with a mast and sail, the wind was too uncertain an agent of motion to allow them to fight when they did not possess missile weapons capable of inflicting serious harm on the enemy. Mobility depended on a ship’s rowers, and galleys were effectively constructed around these. In proportion to their size, galleys carried far larger crews than later sailing ships and nearly all of these men were rowers. Space was highly limited, especially so on a quinquereme which, despite their 40 per cent increase in crew, do not seem to have been much larger than triremes. The weight of the rowers provided much of a galley’s ballast, making it unwise for any great number of them to leave their seats at the same time. There was also very little space available on a ship to carry provisions of food and water. The result was that not only was travel by sea uncomfortable, but very long, continuous journeys were simply impossible. A voyage of more than a few days between friendly ports was risky: If possible the galley was beached each night and the crew allowed to rest, but this was only practical when the shore was not hostile. Most naval battles throughout history have tended to occur relatively close to the shore, largely as a result of the real difficulty fleets had in locating each other in the vast expanse of ocean. In the ancient world this was an absolute necessity, simply because the fleets could not risk moving too far from the shore. Sicily provided the ideal theatre for a naval conflict because its numerous anchorages were within practical range of the fleets operating from home bases in Italy and North Africa. Geography and the might of the Carthaginian navy meant that the conflict was likely to be dominated by sea-power, but at the beginning of the war Rome was not a naval power, largely because she had never needed to be in the past. She may have possessed a small number of ships, and some of her Italian allies certainly had their own navies, but they could not have hoped to form a serious rival to the Punic fleet, especially since it is possible that no state in Italy at that time possessed any quinqueremes. 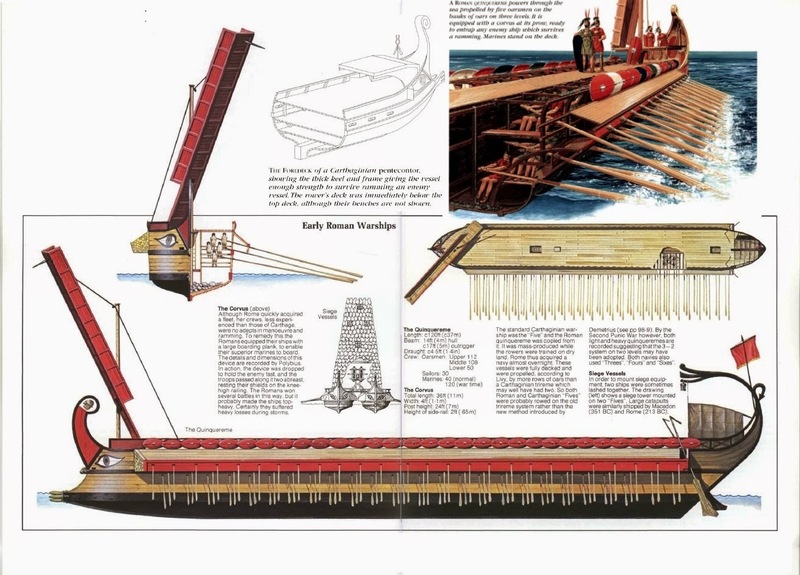 When in 261-260 BC the Romans decided to build a hundred quinqueremes, Polybius claims that they copied the design of a Carthaginian ship which had run aground and been captured earlier in the war. The story is one example of the pride the Romans took in their ability to copy the best weapons and tactics of their enemies, but may still be genuine. Polybius states that they trained the ships’ crews while the fleet was under construction, building tiered benches on land to practise rowing. Yet even with this training, the new Roman fleet lacked the experience and skill of the well-drilled Carthaginian crews and the naval war did not start well for the Romans. The fleet’s commander was surprised in harbour and all the seventeen ships with him were captured by a Punic squadron. The tactics of ramming required skilful handling of a ship and the Romans may have realized that they could not match their opponents in this, as from the beginning of the war they were to rely on boarding the enem~ With this in mind they designed the ‘Crow’ (corvus), a boarding ramp fitted with a spike which stuck fast in an opponent’s deck, locking the two ships together. Once grappled in this way no amount of skill on the part of the Carthaginian crew could break their ship free and the Roman legionaries swarmed across the bridge and settled the affair with their ferocity in hand-to-hand combat. The new device was tested when the massed fleets clashed off Mylae in north-eastern Sicily, 130 Carthaginian ships facing a slightly smaller number of Roman ones. The Carthaginian admiral, commanding the fleet in a ship that had once belonged to Pyrrhus, was confident in his ‘crews’ superiority and attacked aggressively. The Carthaginians did not realize the purpose of the corvi until they began to drop, the beaks spearing into their decks and grappling them fast. Thirty ships, including the flagship, were captured by the Roman infantry, who flooded over the ramps. Attempts to swing round and outflank the Romans were foiled when the Romans turned to face or swung their corvi round to drop over either side of the ship. The battle was a total success for the Romans with between thirty and fifty ships captured by the end of the da~ The prows (rostrata) of these prizes were cut off and sent to decorate the Speaker’s platform in Rome, which in time gave it a new name. In 256 BC the Romans repeated their success at the battle of Ecnomus, at which each side probably mustered well over 200 ships (Polybius gives the Carthaginian strength as 350 and the Roman as 330 which, if correct, would make this one of the largest naval battles in history). The Carthaginians had found no counter to the corvi, but in the next years few years the weather dealt Rome a series of severe blows when three fleets were wrecked in storms. Hundreds of ships were lost and the drowned numbered tens of thousands. Poor Roman seamanship may have been to blame, but it is also possible that the corvi’s weight made the ships less seaworthy. Then at Drepana in 249 BC the Romans suffered their only defeat in a fleet action, a disaster blamed on impiety when the consul, Publius Claudius Pulcher, ignored the unfavourable auspices. When the chickens refused to eat (and so signify divine favour), he is said to have hurled them over the side, proclaiming that if they would not eat, then they would drink. These Roman disasters and Carthaginian exhaustion brought a lull, but in 242 BC the war was decided at sea when the Romans, having risked the creation of another fleet, smashed the last Punic fleet near the Aegates Islands. In the resulting peace treaty Carthage gave up both her fleet and all her possessions in Sicily. Ferdinand (April 19, 1793 – June 29, 1875) was Emperor of Austria, King of Hungary, King of Lombardy-Venetia, King of Bohemia. He chose to abdicate, after a series of revolts in 1848. Ferdinand has been depicted as feeble-minded and incapable of ruling, but although he was epileptic and certainly not intelligent, he kept a coherent and legible diary and has even been said to have a sharp wit. The up to twenty seizures he had per day, though, severely restricted his ability to rule with any effectiveness. As the revolutionaries of 1848 were marching on the palace, he is supposed to have asked Metternich for an explanation. When Metternich answered that they were making a revolution, Ferdinand is supposed to have said “But are they allowed to do that?” (Viennese German: Ja, dürfen’s denn des?) 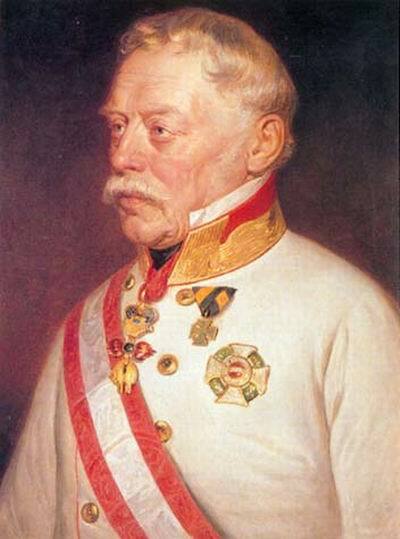 He was convinced by Felix zu Schwarzenberg to abdicate in favour of his nephew, Franz Joseph (the next in line was Ferdinand’s younger brother Franz Karl, but he was persuaded to waive his succession rights in favour of his son) who would occupy the Austrian throne for the next sixty-eight years. Ferdinand was the last King of Bohemia to be crowned as such. Due to his sympathy with Bohemia (where he spent the rest of his life in Prague Castle) he was given the Czech nickname “Ferdinand V, the Good” (Ferdinand Dobrotivý). In Austria, Ferdinand was similarly nicknamed “Ferdinand der Gütige” (Ferdinand the Benign), but also ridiculed as “Gütinand der Fertige” (Goodinand the Finished). He is interred in tomb number 62 in the Imperial Crypt in Vienna. The Habsburg regime, in fact, was not especially oppressive – at least not by the standards of modern dictatorships. Its bureaucracy was generally honest and efficient. Moreover, Metternich used his considerable diplomatic influence to press mild reforms on the more benighted absolute rulers whose intransigence threatened to provoke violent opposition: in 1821 he promised military aid to King Ferdinand I of Naples against the monarch’s rebellious subjects, on the condition that Ferdinand made some minor concessions. Despite all the talk of the rule of law and of the benevolence of the monarchy, Metternich and other conservatives feared that, should constitutional or revolutionary movements have arisen among the diverse peoples of the Habsburg monarchy, then the very integrity of the empire would be endangered. In theory, it was held together by the subjects’ loyalty to the dynasty, the common institutions of the monarchy (including the administration and the imperial army) and, although there were religious minorities such as Jews and Protestants, the Catholicism of most Austrian subjects. In 1815 perhaps only the Germans, the Magyars, the Poles and the Italians had a deep sense of their own national identity. The first three, in particular, also dominated the other subject-nationalities of the empire, politically and socially. In Hungary the Magyar gentry lorded over the peasants who in the north were Slovaks, in the east were Transylvanian Romanians and in the south were Serbs or Croats. In Galicia the Poles tended to be the landlords holding the Ukrainian peasantry in such a state of servitude that they were practically beasts of burden. The Czechs, at least, with their high standards of education and (by 1848) the most advanced manufacturing base in the Habsburg monarchy, were beginning to challenge German hegemony in Bohemia, but one of the seething resentments among the non-Germans was that since the machinery of the state was centred in Vienna, it was dominated by German officials, whose language was usually the official medium in the law, education and administration. Even so, a developed sense of national identity was primarily shared by the aristocratic elites and the urban, middle classes, who were of course precisely the people most frustrated that opportunities in the bureaucracy, the law and in higher education were closed off unless one spoke German. This had not yet trickled down to the mass of peasants, many of whom saw the Emperor as their guardian against the depredations of their landlords, but the very fact that social difference coincided with ethnic divisions would aggravate the frequently bloody conflicts among the nationalities of Central Europe. The resentment of the Magyars against what they saw as German dominance and overbearing Habsburg authority was potentially very dangerous to the empire. Unlike most of the other nationalities, the Magyars had a constitutional voice: the Hungarians had a diet, or parliament, which was dominated by the Magyar nobility, the clergy and the burghers of the free royal towns. Thus the ‘Hungarian nation’ – meaning in contemporary parlance those who were represented in the diet – made up a small proportion of the total population. The rest were legally defined, with graphic aptness, as the misera plebs contribuens – the poor tax-paying plebians (Latin was still, to the chagrin of patriotic Magyars, the official language of Hungarian politics and administration). The Magyar nobility none the less consisted of a fairly sizeable proportion of the Hungarian population – some 5 per cent compared to an estimated 1 per cent in pre-revolutionary France – and some of them were poor enough to be dubbed the ‘sandalled nobles’, since, it was said, they were so penniless that they could not afford boots. Yet, since these men only had their privileges and titles to distinguish them from the rest of the toiling masses, they were often the most resistant to any reform that endangered their status. Although the Habsburg Emperor, who also held the title of King of Hungary, could summon and dismiss the diet at will (and Emperor Francis sulkily refused to call the troublesome parliament between 1812 and 1825), it was difficult to raise taxation without consulting it, so it met in 1825, 1832–6, 1839–40, 1843–4 and, most dramatically, in 1847–8. Moreover, even when the parliament was not in session, the Hungarian gentry entrenched their opposition to the Habsburg monarchy in the fifty-five counties, where they elected and salaried the local officials, and where their assemblies (or ‘congregations’), which often met annually, were sometimes so bold as to claim the right to reject royal legislation. In 1815 the Italians of Lombardy and Venetia fell under Habsburg rule. They, too, had an institutional outlet because they both had congregations, chosen from among local landowners and the towns, as well as the united ‘Congregations General’, which drew together delegates from the two provinces. These assemblies had the right to decide how to implement laws handed down by the government, represented by a viceroy living in Milan, but not to make legislation of their own. The Habsburgs had to tread carefully, for northern Italy was one of the jewels in their crown: Lombardy’s fertile, irrigated plains were a bright patchwork of wheat, of well-kept vines and of mulberry bushes, upon which silk worms produced their precious fibres. The duchy’s capital and, to the irritation of the proud Venetians, of the two provinces together, was Milan, which was culturally one of the most vibrant cities in Europe, thanks in part to the lighter touch of the censor, as compared with elsewhere in the Habsburg Empire. Lombardy-Venetia accounted for a sixth of the monarchy’s population, but contributed close to a third of its tax revenue – a fact that was not lost on Italian patriots. The Austrians worked hard to ensure that northern Italy was well and fairly governed, but the inevitable tensions arose. Educated Lombards and Venetians grumbled that Austrians occupied some 36,000 government posts, preventing Italians from enjoying their fair share of state patronage. Outside Hungary and Lombardy-Venetia, there were no representative institutions worthy of the name in the Habsburg Empire. Since 1835 the Emperor had been the mentally disabled Ferdinand (in one famous outburst, he yelled at his courtiers, ‘I am the Emperor and I want dumplings!’). He was loved by his subjects, who affectionately referred to him as ‘Ferdy the Loony’, but of necessity the task of government was left to a council (or Staatskonferenz), dominated by Metternich. The rejection of constitutional government made repression almost unavoidable, since Metternich’s political vision would not admit the legitimacy of any opposition. There was a secret police, which operated out of offices on the Herrengasse in Vienna, but the number of officers was small – some twenty-five, including thirteen censors – so in the imperial capital they relied upon the regular police (which also handled a plethora of other tasks), while in the provinces local bureaux had to deal with both regular and secret policing. This was not a particularly intense system of surveillance, but it is also true that the activities of printers, publishers and writers were hemmed in with a range of petty, irritating regulations.10 Since only one of four categories of books was fully permitted, this fostered a climate that assumed a publication would be forbidden unless it was explicitly allowed. The repression was particularly tough in Russia, the second of Europe’s pre-eminent absolutist regimes. If Metternich cast Austria in the role of Central Europe’s policeman, then Tsar Nicholas I saw himself as gendarme for the entire continent. The Russian empire had been in his iron, autocratic grip since the death of Alexander I in 1825. He had founded the notorious Third Section, the secret police, an organisation which had a tiny number of officials, but which worked through the gendarmerie and a larger number of informants, who made as many as five thousand denunciations a year. The very existence of police spies created an atmosphere in which it took a brave soul to express dissent openly. One widely believed myth held that in one office of the Third Section headquarters in Saint Petersburg there was a trap door: during a seemingly innocuous conversation, a perfectly innocent individual summoned before the police officials could be lured into saying a minor indiscretion, whereupon a lever would be pulled and the victim would fall into a dungeon below to be subjected to all sorts of unspeakable horrors. The real oppression was bad enough for those who dared to voice their thoughts too loudly. In 1836, when the liberal intellectual Petr Chaadaev lambasted Russia for its backwardness, he met the fate that would be shared by some twentieth-century Soviet dissidents: the government declared him insane and confined him to an asylum. Even (or perhaps, given his quick temper, especially) the great poet Pushkin had to tread carefully: he was tolerated because the Tsar liked his work, but even he was subjected to the occasional rap on the knuckles. Intellectuals and writers cautiously circulated their writings in manuscript among friends first, and only later approached publishers – if they approached them at all. The Tsarist regime did not only fear dissent from among Russia’s intellectuals, it was anxious – perhaps more justifiably – of the possibility of a mass uprising by the peasantry, twenty million of whom were serfs and who had risen up with startling vengeance in the past, most recently under the renegade Cossack Emilian Pugachev in the early 1770s. It also worried about opposition from the downtrodden subject nationalities of the Empire, especially the Poles, who bore their subjugation only between fits of rebelliousness. Since 1795 the old Polish kingdom (except for the Napoleonic interlude of the Grand Duchy of Warsaw, established in 1807), had been wiped off the map, partitioned between Russia, Prussia and Austria – and this was confirmed at the peace congress. The three ‘eastern monarchies’ therefore tried (in vain) to asphyxiate Polish nationalism under their combined weight.